Some fat in the liver is normal. But if fat makes up more than 5-10 per cent of the weight of your liver (your doctor can advise you), you may have alcoholic or non-alcoholic liver disease. Both of these conditions can lead to serious complications. And, there are no symptoms in the early stages – only a blood test and abnormal liver enzymes can signal an early problem. Getting into a healthy weight range is important. This helps you to avoid insulin resistance and metabolic syndrome (a cluster of symptoms including belly fat and two or more of high blood pressure, blood cholesterol, and blood glucose). Insulin resistance can occur when insulin tries to normalise the concentration of glucose in your blood by taking glucose in the blood into body cells (where it can be used as an energy source). Insulin resistance is when the cells become resistant to insulin so that there are high levels of insulin and glucose in the blood. Insulin is a hunger hormone and glucose is converted into fat and deposited around the body – including the abdomen and liver. And, while losing weight is important, it is very important to go slow and steady with weight-loss. Rapid weight loss is not recommended. 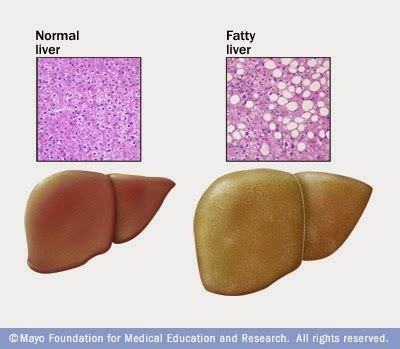 For example, non-alcoholic fatty liver disease (NAFLD) can develop in some people following surgery to reduce obesity and may be due to rapid changes of fats in the blood when the body encourages the liver to produce fats to make up for the fat missing from the diet. Alcohol is also a well-known cause of liver damage – and if you regularly drink over the recommended lower risk guidelines, you increase your chances of developing live problems which can be irreversible. The liver turns glucose into fat which it sends round the body to store for use when we need it. Alcohol affects the way your liver handles fat so your liver cells get stuffed full of it. Alcohol causes oxidative stress when the liver tries to breakdown alcohol into something less toxic. The damage can lead to inflammation and scaring as your liver tries to repair itself. Alcohol also causes toxins from your gut to get into the liver and these can cause inflammation and scarring, too. Don’t drink alcohol every day. Daily drinking increases the chances of your body becoming tolerant to alcohol. Taking days off alcohol helps to give your body a break and time for your liver to heal itself. It is important not to drink more than the safe limits. If you need help, speak with your GP. Eat well. Good nutrition can help to support your liver to function and plays a crucial role in your health. Enjoy two fruits and five veggies or more daily and always fill half of your plate with fresh produce and only a quarter with lean protein and a quarter with wholegrain or wholemeal carbohydrates help to shift the balance to healthier eating. You will automatically consume fewer calories if you go for this kind of portion perfection. A healthy weight loss is about half to one kilos per week. 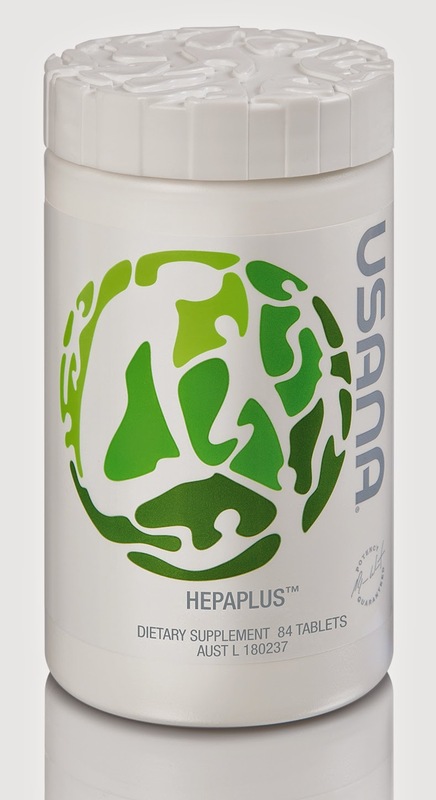 HepaPlus also contains a bioavailable from of turmeric extract to support healthy liver function. Turmeric is widely used in both Ayurvedic and Chinese medicine as an anti-inflammatory, to treat digestive and liver problems and skin conditions. In animal studies, curcumin, the pigment that gives turmeric its distinctive yellow colour can slow the changes caused by excessive alcohol consumption that lead to liver damage. [i] It can also lower the levels of two body enzymes that cause inflammation.